Most hedgehog owners agree that hedgehogs are relatively easy to care for and maintain. Fresh food, water, and regular cage cleaning are it’s basic requirements. One must be careful not to take the hedgehog’s easy care for granted. A hedgehog not closely monitored, can become neglected. A small problem can result in death of the hedgehog, if a problem is not addressed in a timely manner. The amount of maintenance required is determined in part by the cleanliness of the hedgehog and your perception of ‘work’, as an owner. Most breeders recommend a medium size, solid surfaced, guinea pig cage with a minimum of four square feet. Ten to 15 gallon aquariums were once recommended, but most hedgehog enthusiasts and experts now agree that aquariums this size do not have adequate floor space for hedgehogs. Many commercial hedgehog foods are available but they are all not equal in nutritional value or ingredient quality. One should become familiar with their hedgehog’s needs, before purchasing foods, because some foods marketed for hedgehogs are quite inappropriate as a staple diet. Spike’s Delite Ultra by Pet Products (1-877-977-8310) is a quality hedgehog food that is used by many breeders. Other breeders use a blend of dry cat foods. Hedgehogs should be kept on the same diet as the breeder/previous owner for at least a week of adjustment before changing foods. Please review the Diet Section for more information on this topic. One benefit of having a hedgehog as a pet is that you never have to take your hedgehog for a walk. Most of your hedgehog’s exercise requirements can be met with an appropriate size cage and a large 12” solid surface exercise wheel. Many hedgehogs will enjoy roaming around a ‘hedgehog-proofed’ room or benefit of supervised outdoor playtime. 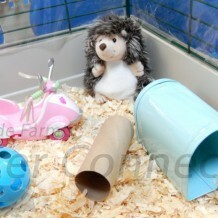 Please review the Care Section for more information on safe exercise and play for your hedgehog. Hedgehogs in the wild have been known to travel several miles in one night so never underestimate their need to stretch their legs. To have a well-socialized and friendly (tame) pet, you must handle your hedgehog on a regular basis. New pet owners will need to spend a considerable amount of time bonding with their new pet. Daily interaction is best and your hedgehog will more readily accept shorter, more frequent handling sessions, rather than a less frequent handling that lasts for hours. You must be prepared to keep your hedgehog warm. Hedgehogs require temperatures in the range of 74 °F to 80 °F. If temperatures fall below 70 degrees your hedgehog may attempt to hibernate which can be hazardous to your pet. Supplemental heating is usually required to maintain the recommended temperatures. See Keeping Your Hedgehog Warm article for more information on this topic. Most, but not all, hedgehogs are neat about their elimination habits and some will regularly use a litter pan. Daily spot cleaning of soiled bedding or cleaning of the litter pan (if used), is the best way to keep your hedgehog’s cage clean and smelling fresh. A regularly maintained cage and hedgehog that is fed a good diet, will typically not smell. You will still need to completely change your hedgehog’s bedding on a regular basis. If daily spot cleaning is not possible, then you should completely change your hedgehog’s bedding at least once per week. You will also need to sanitize the cage before you add new bedding. Cage companions are not necessary. Two females raised together often do very well together. Two males raised together may fight when they get older. It is NEVER a good idea to house a male and female together except for breeding purposes and then only a short time. Please see our article Are Hedgehogs Solitary or Social? for more information on this topic. Hedgehogs do not groom themselves. Most do scratch and shake to adjust their spines. However, many hedgehogs will occasionally need bathing or feet soak if they become soiled. Nail trimming will need to be performed on a regular basis as well. You should have a veterinarian lined up prior to bringing a hedgehog home, as all animal hospitals do not treat exotic animals. Hedgehogs will need an initial pet checkup from your veterinarian and a yearly checkup thereafter. You will need to seek medical treatment for your pet for any emergency, as well as any other health concerns. Hedgehogs, like humans, can become ill from infections, suffer from cancer, and experience age related health complications.